China will soon finish construction on what will be the world’s tallest and longest glass pedestrian bridge, floating 300 meters above a canyon in the Zhangjiajie National Park. Designed by Israeli architect, Haim Dotan, the Zhangjiajie Grand Canyon Glass Bridge will be 380 meters long, six meters wide and feature a transparent glass floor. “The Zhangjiajie Glass Bridge was designed to be invisible as possible -- a white bridge disappearing into the clouds,” said Dotan. The bridge will comprise two side steel beams, a structural glass deck, handrails and side suspension cables, with the capacity to hold up to 800 people at a time. 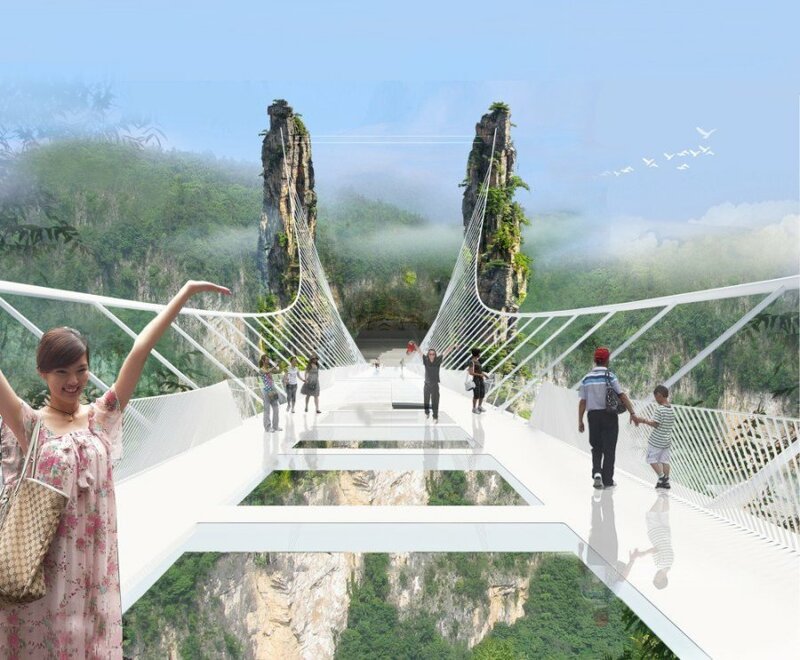 The Zhangjiajie Grand Canyon Glass Bridge will also contain a bungee jumping spot and be used as a runway for fashion shows. Construction is expected to wrap up in July, with the bridge officially opening to the public in October 2015. This follows the country’s recent inauguration of the world’s longest glass skywalk in Longgang National Geological Park in Chongqing. China Set To Open World's Longest And Highest Glass-Bottom Bridge originally appeared on ArchDaily, the most visited architecture website in May 2015.